Kerlix™ Bandage Rolls are made of prewashed, fluff dried 100% woven gauze with unique crinkle-weave pattern for loft and bulk to cushion and protect wound areas. Can be used as a primary or secondary wound dressing. 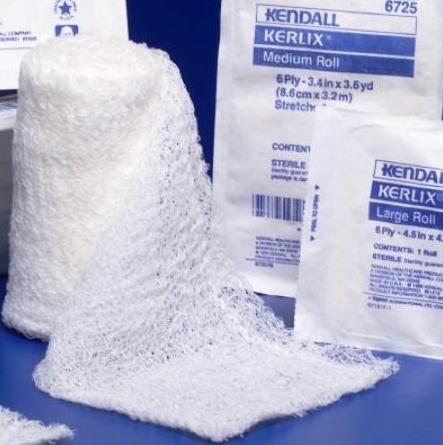 Kerlix™ Gauze Bandage Rolls provide fast-wicking action, superior aeration, and excellent absorbency when used as a primary dressing. When used as a secondary dressing they provide bulk, cushioning, and ultimate conformability. Ideal for use in bandaging heads, limbs, and difficult to dress wounds such as burns, plastic and orthopedic wounds. KerlixTM gauze features finished edges on the product reduce loose ends and lint. This product is available in 6 and 8 ply as well as various widths and lengths.